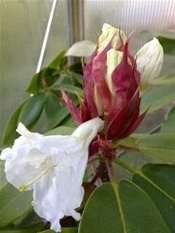 Rhododendron auriculatum is one of the rather few elepidote species with fragrant flowers. It is also one of the latest flowering of all rhododendrons. It starts growth very late and the current season's shoots harden very late. It is not hardy here and its late growth make it most suitable for protected woodland gardens also in milder climates. Always eager to try exotic plants I nevertheless bought a nice specimen from Rhododendron-Haven, Denmark several years ago. It was an interesting pot plant if somewhat sparse growing. I had the impression that R. auriculatum and similar tall-growing species flower only when old. To my great surpise my specimen formed fat flower buds already the next year, when only about 1m tall. In July 2011, which was record hot in Finland, the flowers opened. The flowers were luminous white, petals a bit wrinkly, and had a stong and pungent scent of cloves. The scent was totally different than the sweet, strawberry-like fragrance of R. fortunei. I pollinated my auriculatum with several different pollens, but unfortunately none produced seeds. Since I had now seen the flowering and we don't have a conservatory for longer-term maintenance of such tender plants I left the poor plant at the mercy of the elements outside, where it perished the next winter.